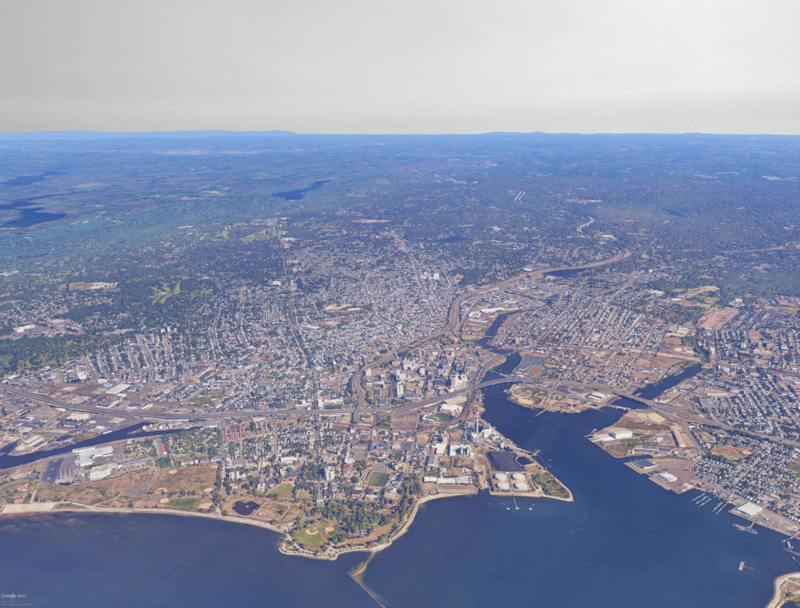 It’s 2040, and the city of Bridgeport is flourishing again as the center of a new green economy in Connecticut. This coastal city is alive with entrepreneurial activity. At the Lake Success eco-business park, innovative urban agriculture is producing food for school cafeterias and downtown restaurants. A long-time resident of the South End who lives in a permanently affordable home has a job with a living wage at the University of Bridgeport. A doctor from a nearby town travels by train to the new Barnum Station to work at Bridgeport Hospital. Across the city, residents enjoy clean air and abundant parks, paths along Long Island Sound, and the Tri-State Trail Network, which connects the city to transit, nature, and neighboring towns. Young families have access to quality childcare and schools, and older residents are connected to services that let them age in place. Bridgeport had a strong legacy as a center of commerce and industry, but like so many similar cities across the country, languished in the post-industrial era. From the late 19th century through World War II, Bridgeport produced machinery, garments, and munitions and was the headquarters for many national corporations including Dupont, General Electric, Remington Arms, and Remington Shaver. After World War II, the jobs that powered Bridgeport’s economy disappeared as production declined. In the middle of last century, Bridgeport lost jobs and people as those who were able to leave for the suburbs - primarily the city’s white population- abandoned the city. This exodus, fueled by the GI Bill, excluded black residents who were refused loans for mortgages and were not allowed to purchase homes in nearby suburban towns through redlining and steering practices. The resulting racial segregation, loss of jobs and tax revenue, and brownfield contamination left little remaining economic opportunity for Bridgeport residents. The city struggled to find its footing, and as property values declined, property taxes soared. 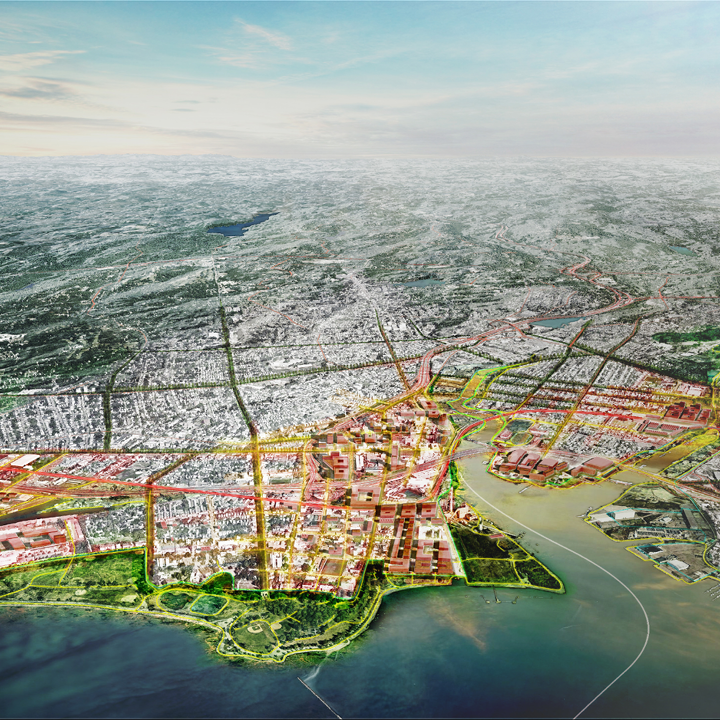 The tide turned for Bridgeport early in the 21st century with land reclamation. Many hazardous sites—including the infamous landfill dubbed “Mt. Trashmore”—were cleaned up. Pleasure Beach was reopened to residents and visitors, and a $500 million federal grant supported resilient infrastructure investments in the South End to help control flooding. Coal-powered electricity was converted to gas, and the red and white smokestacks standing beside I-95 no longer polluted the air. 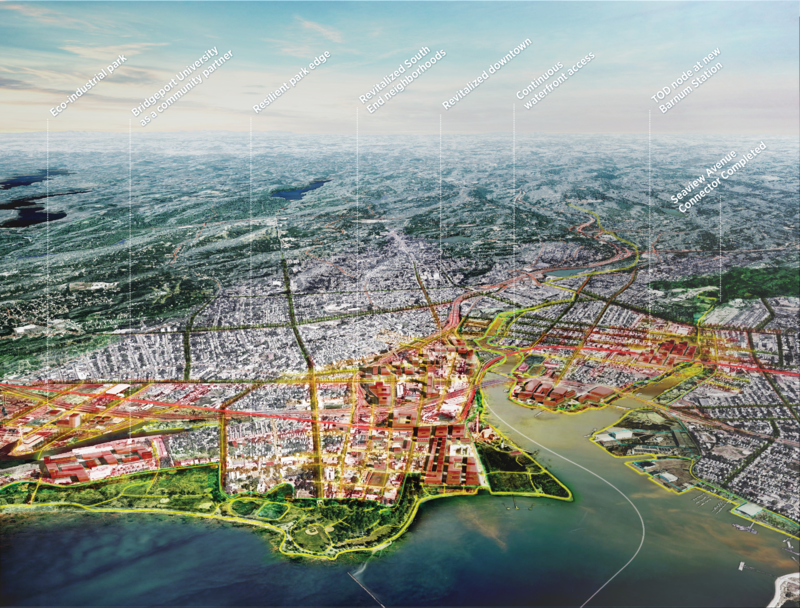 As redevelopment continued over the next few decades, Bridgeport actively worked to correct environmental injustice and pursue sustainability. The East End, once dominated by brownfields and vacant lots, became a regional employment center with the new “Barnum” rail station along the Northeast Corridor, a thriving Bridgeport Hospital, and an innovation hub for biotech companies. The Echo Technology Park, developed on reclaimed industrial land in the West End, grew into Connecticut’s premier location for sustainable industrial practices, including district heating and cooling. Commuting times to New York City and Hartford by rail were substantially reduced with efficient regional rail service. Highway commuting times also decreased with congestion pricing on I-95 and more people using faster and more reliable train and bus service. The transformation of Bridgeport wasn’t easy. Over time, the City of Bridgeport became a strong partner with its residents, businesses owners and community development organizations, and working together they moved the city forward. Visionary and diverse local leaders became more actively engaged in planning and decision-making alongside long-time community advocates. Bridgeport’s higher education and healthcare institutions became stronger neighborhood anchors through training and hiring local residents, helping to create and support local purchasing supply chains and investing in affordable housing and neighborhood infrastructure. With state reforms and incentives for inter-municipal collaboration and shared services, property taxes in the city started to decline and are now on par with neighboring suburban towns. The region is less segregated by race, ethnicity and income and the achievement gap between low income and affluent students has narrowed. School performance in Bridgeport is now high and strong partnerships between anchor institutions and local companies are providing easily accessible career pathways to students. Substandard, unhealthy housing has been replaced with new, affordable homes in walkable, mixed-income, and diverse neighborhoods. Downtown is a vibrant, walkable, live/work hub for the region’s creative entrepreneurs who take advantage of fast, reliable, local train and bus service. Old and new residents in Bridgeport are able to live comfortably without owning a car. Steelpointe Harbor has evolved into a mixed-use waterfront , attracting residents and visitors from throughout the region, and the Seaview Avenue connector is a thriving complete street corridor linking the Bridgeport waterfront and I-95 to the Naugatuck Valley. Bridgeport is a model for how to transform once struggling small industrial cities in the tri-state area. Investment in redevelopment and sound urban policies allowed Bridgeport, and other cities like it in the region, to become centers of economic growth with a talented workforce and attractive properties—just as New York City became too expensive. This urban resurgence took place without the displacement of longtime residents. The exact formula was different in each place, taking advantage of unique assets and circumstances. But the elements were similar: committed, sustained leadership from government, business, and civic groups and anchor institutions; a strong partnership with local residents and meaningful community engagement in planning and development decision making; collaboration with the state and neighboring towns; catalytic investments in transportation and resilient infrastructure; property tax reforms that reduced reliance on local property taxes to fund local services; and resources and incentives that encouraged school district consolidation and integration.